I was 2 miles off the beach in a 15-foot kayak when I spotted three waterspouts howling toward me. Wind whipped the rain sideways and flipped my kayak twice. I lost my paddle. When I finally reached the beach and caught my breath, I decided to buy a boat. As I was growing up, my dad had a series of boats, including a 20-foot Bertram and a 24 Albemarle. Early on, I learned the value of solid construction and a soft ride. 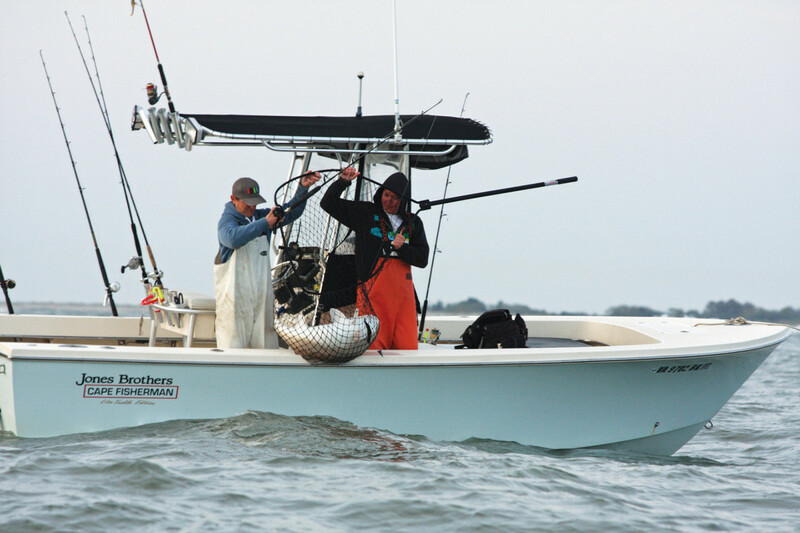 Fishing out of Virginia Beach, I needed a boat that could go from backwater to offshore in any weather. 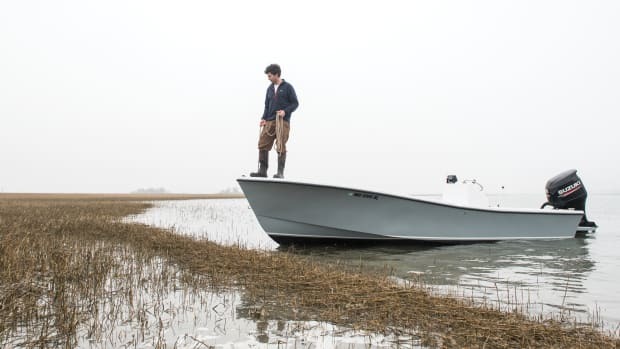 I settled on a short list of builders based in eastern North Carolina, where snotty seas and talented craftsmen come together to build tough, handsome boats. The author, in white bibs, with a nice red drum. 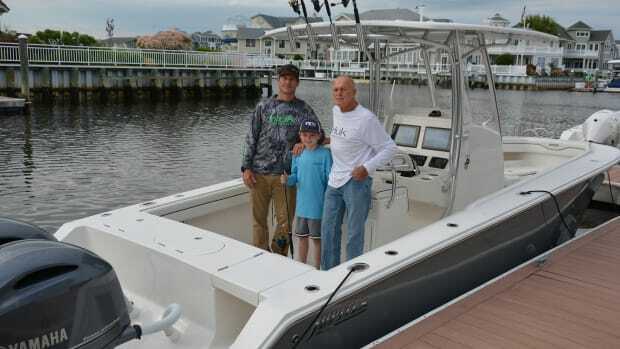 At the top of the list: a 20-foot Jones Brothers Cape Fisherman with a Yamaha F150 4-stroke. Beautiful: check. Tough: check. Economical: check. Top-quality: check. 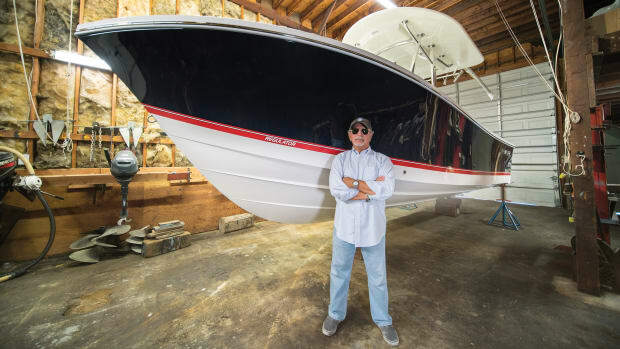 When I went to the factory in Morehead City to pick up my new boat, Donnie Jones sat me down in his office to walk me through the ups and downs of boat ownership. “It’s all part of the adventure,” he told me. My boat and I have had some adventures. I named her after my daughter, Daria Marie, who is also smart and beautiful. 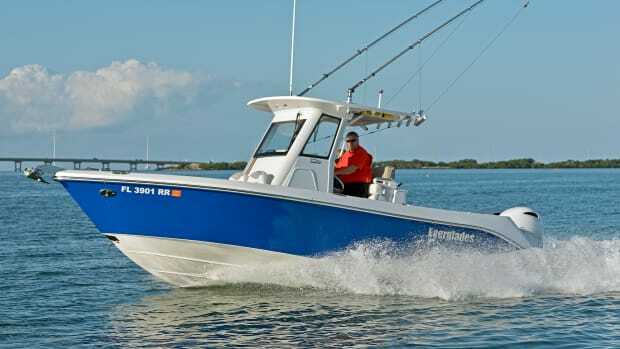 From big fish to big seas, the little blue boat has carried me through 10 years of hard-core fishing. 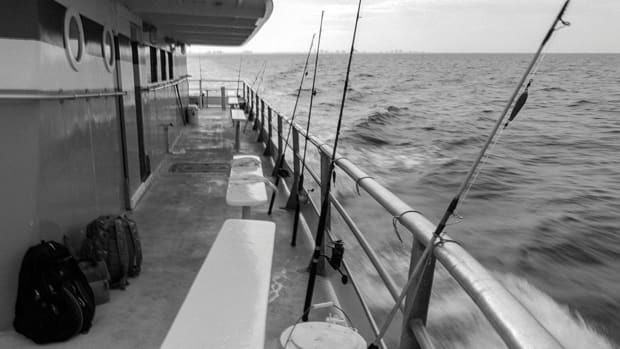 We’ve landed 200-pound thresher sharks, caught an elusive Virginia tarpon, pioneered fishing for big red drum, cobia, dolphin and striped bass, and filled the fishbox. She has navigated day and night through the worst weather. 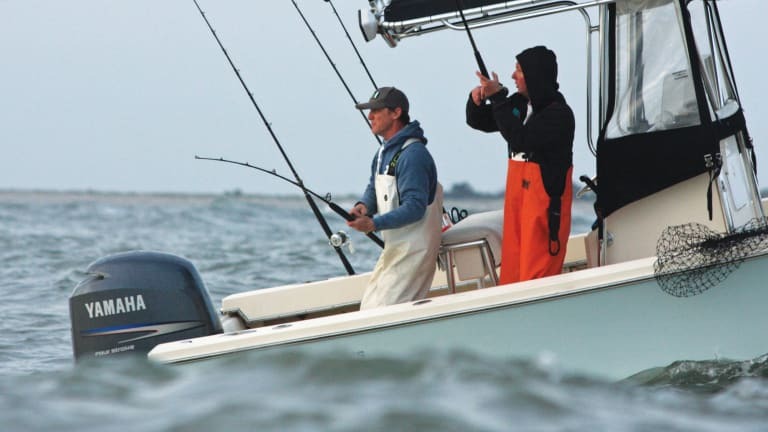 There was the time we ran 50 miles into a 20-knot head sea. 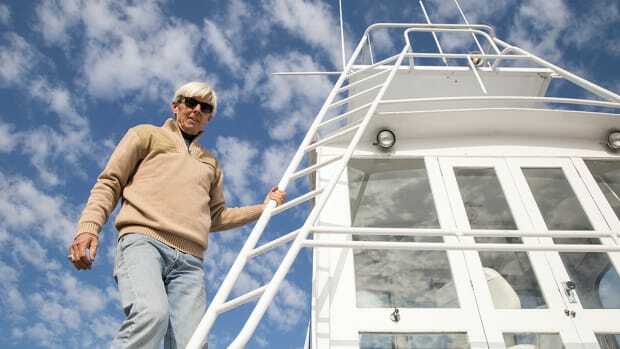 Many days we continued offshore when bigger boats turned around at the sea buoy. We’ve survived thunderstorms and snowstorms. She’s not the fastest boat, but when the waves are 4 to 5 feet at six seconds, my Jones churns through the washing machine with a dry, easy ride. Daria Marie has survived 2,500 hours of use and abuse. She is the only boat I have owned and, hopefully, the only boat I will ever own. Through it all, any time I have an issue, Donnie Jones is always quick with answers and advice. But he had one thing wrong. 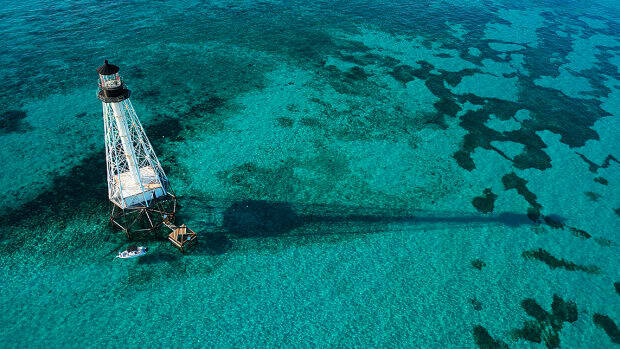 My boat isn’t part of the adventure — she is the adventure. Ric Burnley is a freelance writer, editor, speaker and photographer who lives in Virginia Beach, Virginia. 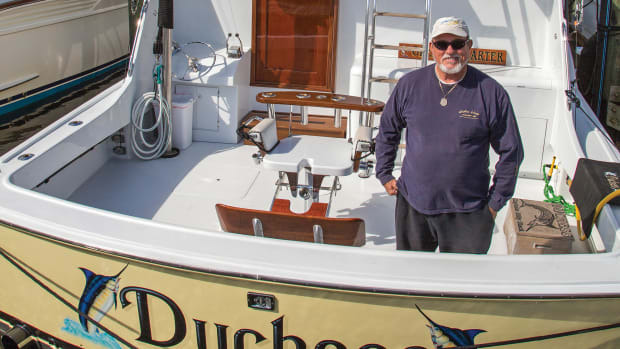 His wife accuses him of buying their house just because it has a perfect space for his boat.